A Guernsey diver has asked for help to solve the mystery of a 100-year-old shipwreck. Richard Keen said his research, which started in the 1970s, led him to believe what is known as the Mauve Wreck was the Frier Krupp. He said based on weather patterns and the ship's expected course and speed he believed it had to be that ship. Mr Keen said the Krupp shipping company still existed and hoped a German speaker would help with his research. He said the wreck was first found in the middle of August 1912. 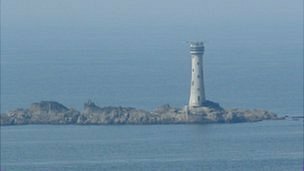 Mr Keen said: "A fisherman, Nicholas Le Sauvage, went out to pull his pots by the Mauve Reef, which is 300 yards from the Hanois Lighthouse, and there was a rock there that wasn't there the year before. "It turned out to be a ship's boiler, so the following day he went out with George Le Couteur and the Lloyd's agent and a few other fishermen to investigate and there were a few bits of iron sticking out of the water. "They deemed from the size of the boiler it would be a vessel of about 600 tonnes." His own interest began 40 years ago: "The wreck site was shown to me by a fisherman. There was nothing of much interest, shallow water, all weed, bits of rusty iron and general junk not even any sign of a ship's engine or propeller shaft. "It's always known as the mauve wreck and it's one of those mysteries that has always bugged me. "I researched it 40 years ago and found not a lot, but I got stuck in recently and in the guildhall library of all places I found a record of a German vessel called the Frier Krupp, which left Bilbao [in Spain] on 16 December 1911 bound for Rotterdam with a 1,000 tonnes of iron ore.